Now here comes my fav combination. This combination is specially made during the day of diwali. 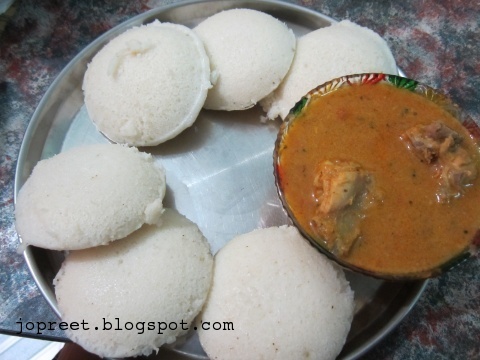 We prepare mutton curry with idli. At that time, i eat even 10 idli 🙂 My mom made this today especially for me. Grind clove, cinnamon and sliced onions to a smooth paste and keep it aside. Grind green chilli, coconut and fennel seeds adding 2 tbsp water. Keep it aside. Now Grind tomato slices to a smooth paste. To get more gravy we are grinding these ingredients separately. Heat oil in pressure cooker. Tamper mustard seeds and curry leaves. Add Onion paste and saute for a while. Add ginger-garlic paste. Fry tomato paste and add coconut paste. Fry till nice aroma comes. Add turmeric, red chilli powder, garam masala and coriander powder. Add chicken pieces and mix well. Add salt to taste. Add 2 cup water to make it thick kuzhambu. Close the lid and cook in medium flame for 3 whistles. If kurma is not thick you can cook it for 5-10 mins more with no cover and let it boil for a while. 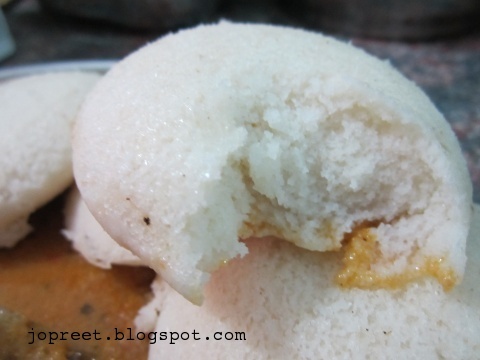 If idli batter is refrigerated, keep it outside before 30 mins. Grease oil over idli plates. Take a ladle full of batter and pour over the plate. Add water to the idli vessel and heat it. Once water starts boiling, keep the idli plates in the vessel by order and close the lid. Let it cook for 10 mins. Once hot steam comes from the vessel, remove it from the heat. 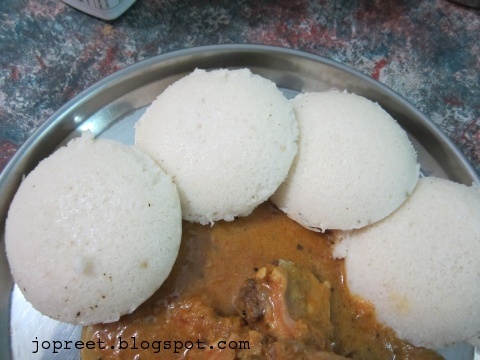 Take out the idli with the help of a spoon and keep aside. Serve hot with chutney or sambar or any non-veg curry. Yummy,delicious and inviting combo,salivating here. Wow…this is my family fav combo too 🙂 super soft idli n yummy kurma looks too inviting!! Lovely preparation dear! This is mouthwatering. Very good recipe! 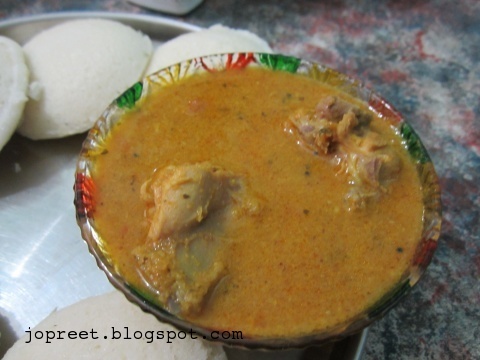 wow…..yummy korma and soft idlis….